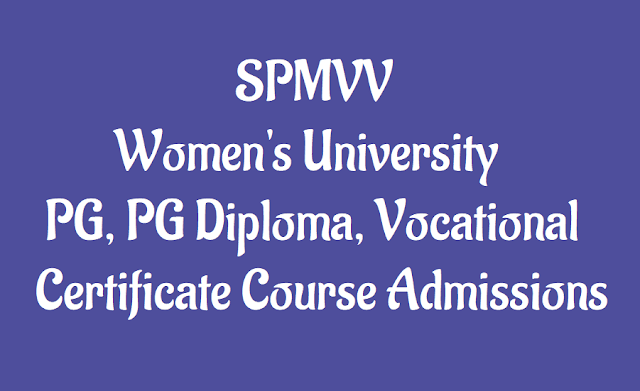 Sri Padmavati Mahila Visvavidyalayam, Tirupati(SPM Women’s University) has issued Integrated, PG Diploma, B.Vocational and Certificate courses admission notification on May 28th, 2019 and SPMVV invite the applications invited from all eligible women candidates for admission into 5 year Integrated, PG Diploma, B.Vocational and Certificate courses offered by Sri Padmavati Mahila Visvavidyalayam, (Women’s University), Tirupati through Direct Admission for the year 2019 for the following courses. All students of Andhra Pradesh and State of Telangana are local students to SPMVV. The admissions will be given to the students belonging to Andhra, Rayalaseema and Telangana regions in the ratio of 42 : 22 : 36 respectively. The Directorate of Admissions, SPMVV, by hand on submission of DD for Rs. 425, by post for DD of Rs. 465. It can also be download from the website. Filled in application forms must be submitted with necessary documents to the Director SPMVVPGCET - 2019, Directorate of Admissions, Sri Padmavathi Mahila Visvavidyalayam, (Women’s University), Tirupati, Chittoor Dist, A.P.